Well what do we have here? 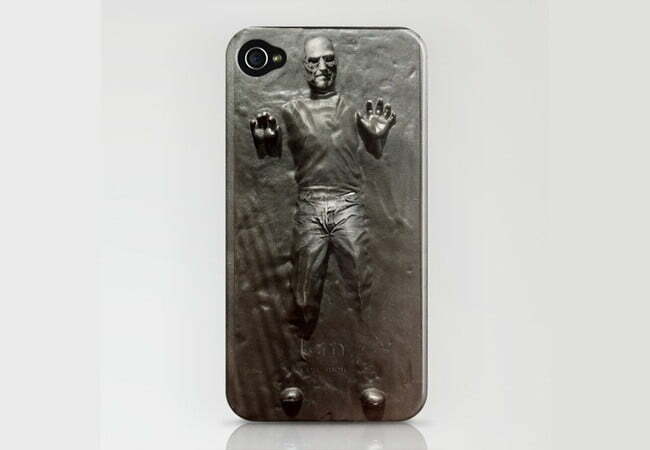 It seems that someone at Society6 has taken fandom for both Apple and Star Wars to extreme and twisted levels with a new iPhone case that features a rather creepy-looking Steve Jobs frozen in carbonite. The case is of course based off of the infamous Star Wars Episode V: The Empire Strikes Back scene in which Han Solo is encased and rendered immobile in carbonite. The dark grey silvery case features a disturbed-looking Jobs, complete with jeans, mock turtleneck, and glasses, struggling to get out from…your iPhone? We’re not really sure what the intended message is here, but we’re sure that some fans of both Star Wars and Apple will want to get their hands on one of these creepy cases. It would no doubt be an interesting conversation starter. The snap-on Steve Jobs in Carbonite case ($35) has a slim profile, is impact-resistant (luckily for frozen Steve Jobs), and is available to fit the iPhone 3G, 3Gs, or 4.